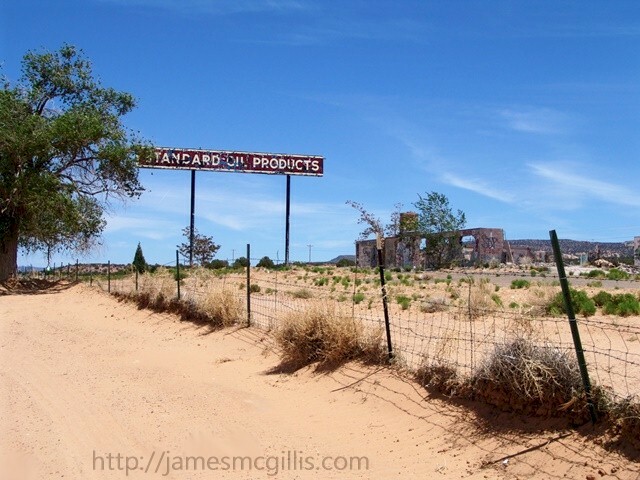 After witnessing the disappearance of Black Mesa Mine, I wondered what else might be fading away within sacred Navajo and Hopi lands. 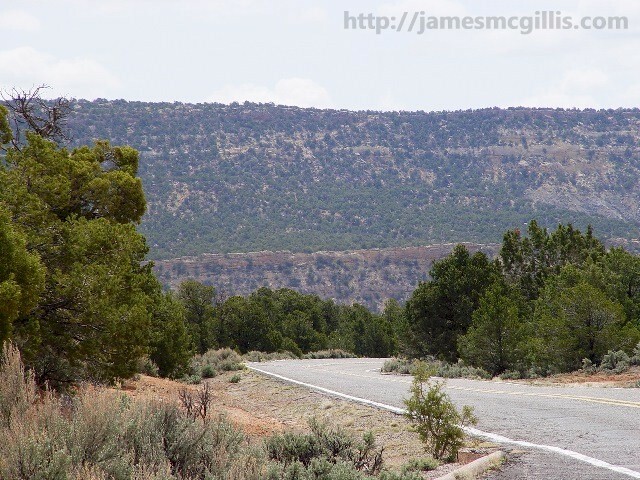 Thirty miles south of Black Mesa, for almost a century, Cow Springs Trading Post survived and prospered. The documented history of Cow Springs is spotty, at best. Most references to the place are in footnotes or old field-notes. Around 1970, when the last Cow Springs Trading Post closed, the place began its slow-motion disappearance. The Cow Springs sandstone occupies a considerable interval in the Jurassic Stratigraphic Period. The Jurassic period existed long before the Tertiary Stratigraphic Period, when most of earth’s coal deposits appeared. At more than 150 million years in age, Cow Springs occupies an ancient place in geologic history. The earliest historical mention of Cow Springs involves the Spaniard, Vizcarra, during his 1823 campaign. In an obvious reference to the nearby Elephant's Feet pillars, Vizcarra and his compatriots named Cow Springs Wash "El Arroyo de los Pilares". For almost one hundred fifty years after Vizcarra's visit, Cow Springs disappeared from historical consciousness. Decades later, perhaps in the early twentieth century, someone again documented the existence of the place. “East of the sandhills, bordering Red Valley runs Cow Springs Canyon and Wash. Up this canyon from the springs, George McAdams set up a summer and fall trading camp 1882”. During a brief period when Indian trader J. L. Hubbell Jr. owned it in the 1930s, Joe Isaac managed the Cow Springs Trading Post. Son of Joe Isaac, Lawrence Isaac Sr., ran the coalmine at Cow Springs from the 1930s until the 1950s. According to Geological Survey Professional Paper, Volume 521, the mine operated on coal-rich Black Mesa, seven miles east of Cow Springs. By the 1970s, coal extraction attributed to the old Peabody Western Coal Company would come to dominate the economies of both the Navajo and the Hopi tribes. In 1889, David, George, William, Charles, and Edward Babbitt established the Babbitt Brothers Trading Company in Flagstaff, Arizona. Later, they owned a series of trading posts and other businesses in the northern part of the state. Babbitt's Wholesale, Inc. and the Babbitt family have been distributors of Pendleton blankets and accessories across the Southwest for more than one hundred twenty years. Some of the best-known Babbitt posts were located at Tuba City, Willow Springs, Canyon Diablo, Cedar Ridge, Tolchaco, Indian Wells and the ancient town of Oraibi. Notably absent from that list is the Cow Springs Trading Post, first operated by the Babbitt's in 1895. “So by the time I became involved in our trading operations, it was already becoming a dying part of our family’s business. From the time I started in the business, we had five trading posts. 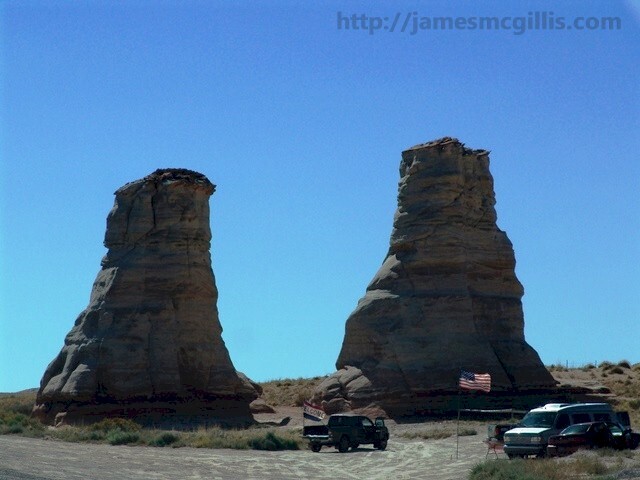 Today, 1999, we are down to only two—Tuba City and Red Lake. We closed down Cedar Ridge Trading Post, we closed down Cow Springs Trading Post” - Jim Babbitt, Babbitt Brothers Trading Co. oral history. On August 14, 1938, there were recorded bird sightings at “Cow Springs Lake”, which was not far from a similar sighting at Red Lake (now Tonalea, elevation 5010) in Coconino County, Arizona. Red Lake was another old trading post site, just south of the Elephant's Feet pillars on U.S. Highway 160. At that site today, there is a general store, which provides Pepsi and hay bales to local residents. Today, there is no flowing water at Cow Springs, nor is there much of a lake at Red Lake. Only a seasonal pond, which stands south of the highway at Tonalea, hints at Red Lake's historical status as a year-around lake. With the long-term drying of the local climate, Red Lake disappears into a dusty plain. Now, Cow Springs Lake faces the prospect of a similar fate. At the crossroads of Begashibito (Béégashi Bito'), or Cow Springs, and the old road to Shonto, is the possible location for "Luke Smith's store". Even in the early days, traders looked to create catchy names for their trading posts. Begashibito plus Shonto morphed into the new Navajo word, . In a larger version of the circa 1929 image (above right) on this page, “Begashonto” appears on the sign in front of the store. In the early 1960s, highway engineers realigned old Arizona 264. The new U.S. Highway 160 bypassed the tiny hamlet of Cow Springs, thus forcing relocation of the old Cow Springs Trading Post. Even with its prominent new location on a busier highway, the trading post did not survive for long. 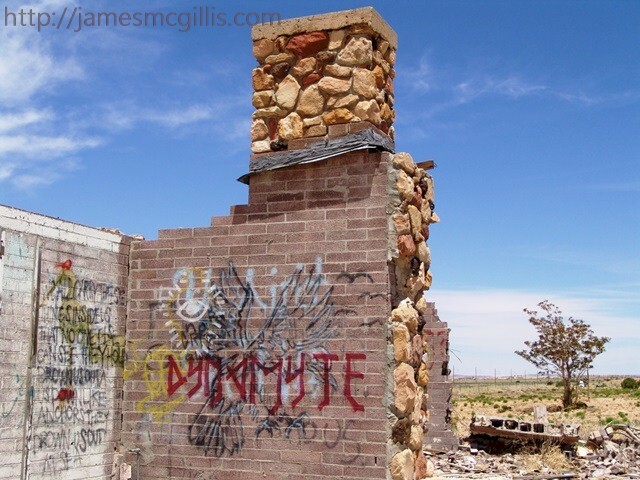 Today, a pole-sign, some graffiti covered walls and a stone-topped chimney are all that remain. With its business lifespan cut short, there are no published pictures of the Highway 160 Cow Springs Trading Post while in operation. 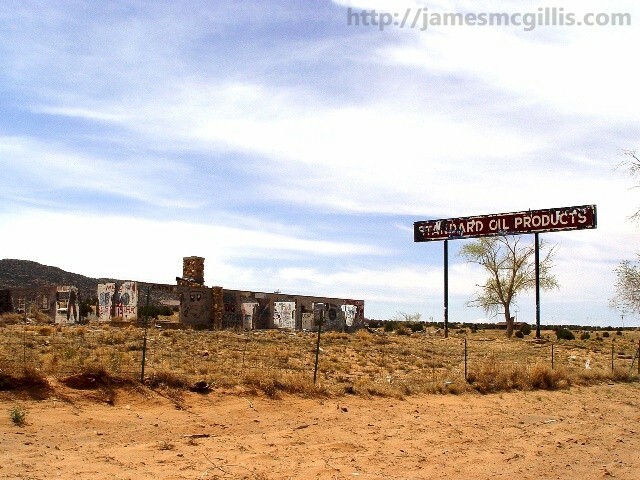 With its imposing pole sign declaring “Standard Oil Products”, the ruin helps break the monotony along that stretch of highway. 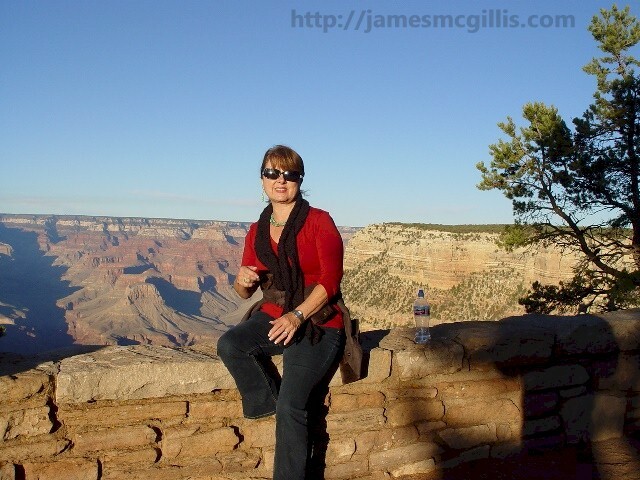 In 2009, I stopped at the Cow Springs Trading Post. Until they changed corporate colors in the 1960s, the old Standard Oil Company of California utilized white lettering on a brown background for signage on their west coast service stations. After decades exposed to sun, rain and wind, large portions of brown and white paint now fly away. Like the stratification record for the Cow Springs Sandstone, layers of paint intermingle as they erode through paint and primer. Completing a cycle, in 2013 the original words “Cow” and “Post” reasserted themselves at either end of the sign. In the 1960s, improved highways and reliable automobiles meant that motorists had greater range and options. With its unusual name and remote location, tourists often bypassed places like Cow Canyon Trading Post. They might, however be attracted to an iconic brand name, like “Standard Oil Products”, thus stopping there for fuel and provisions. Even today, the size, height and immensity of the Cow Springs sign create an imposing sight. Only the height of its steel poles has prevented untold repainting with graffiti art. 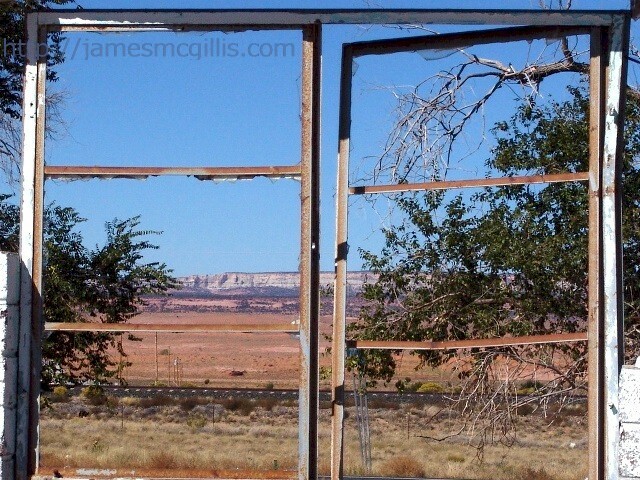 At various times over the years, I have stopped to investigate the ruins of Cow Springs Trading Post. 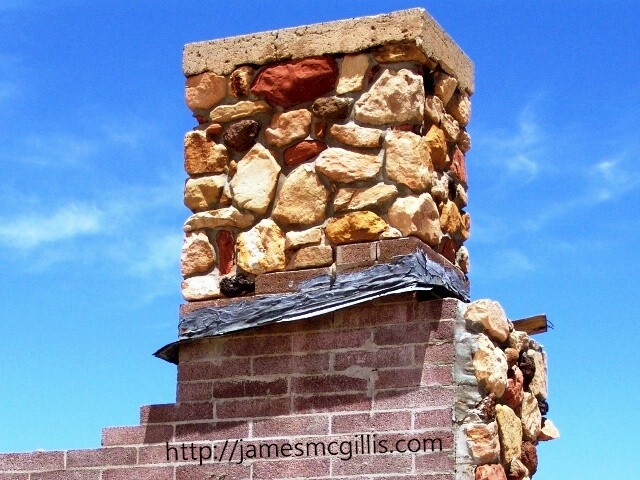 By the time I first stopped in 2007, there was no roof and various partition walls were missing. There were no signs of a fire, so someone may have removed and repurposed the roof beams elsewhere. Also absent was almost any form of scrap lumber. Known for its cold winter nights, local residents may have collected and burned any scraps of wood remaining at Cow Springs. 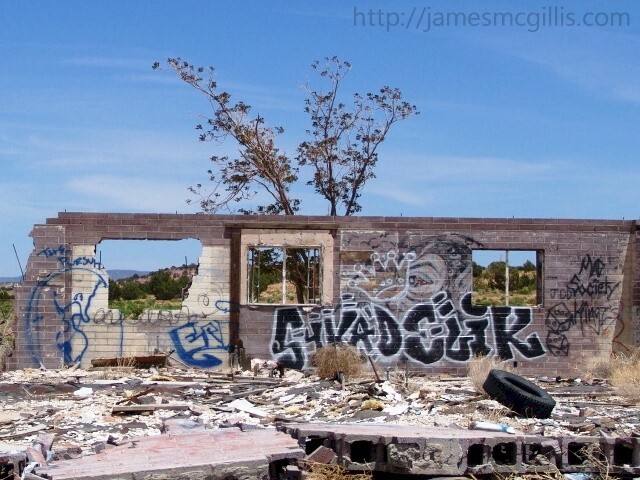 Despite the derelict nature of the building, a spray painted combination of angst-ridden poetry and high art filled various panels. With each subsequent visit, more holes appeared in the walls. Successively, additional hits of graffiti obscured or defaced many of the more artistic panels. Additional sections of block wall tumbled, some with their artwork still intact. In one case, wall art became floor art. In order to topple walls or make new holes, ad hoc wrecking crews employed sledgehammers. With less space to express new poetry and art, the hope and pride expressed in the early artwork later turned taciturn and reticent. Visionary sights of a Navajo warrior and a Golden Eagle disappeared under gang-style monikers and random bursts of paint. 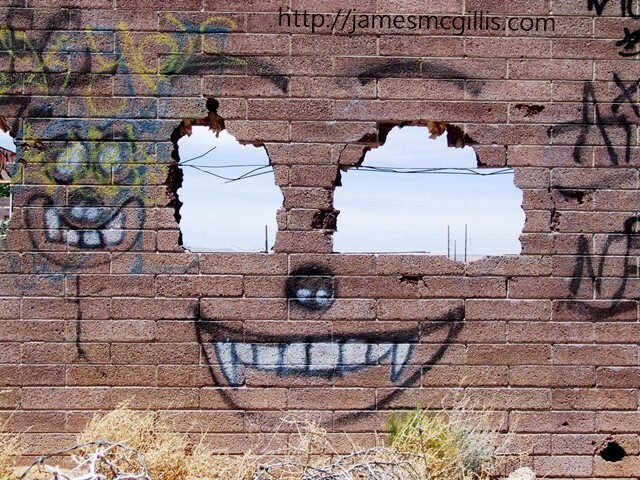 In a stroke of spontaneous irony, a spray-paint cartoonist used several of the holes to elucidate facial features in his characters. Dystopian anger at the human condition ran through several muddled poems. Just when artistic expression at Cow Springs reached an all-time low, a new artist with a new medium arrived on the scene. 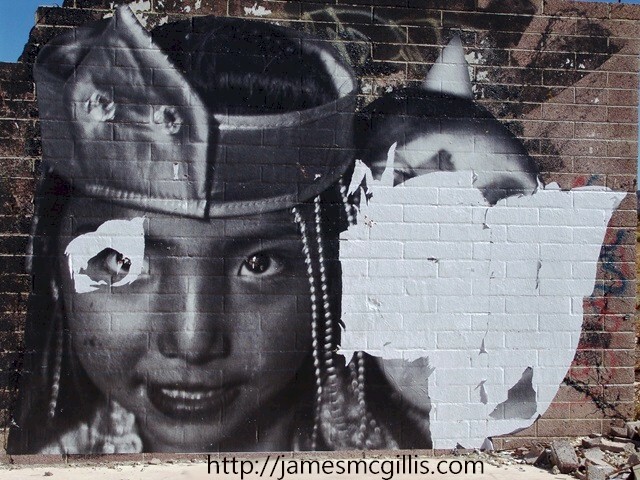 Almost overnight, he covered several walls with his wheat-paste photo murals. Hailing from Inscription House, elsewhere on the Navajo Reservation, that artist goes by the name of Jetsonorama. He selects photos from his collection, enlarges them at a print shop, and then cuts them out on his kitchen floor. Utilizing wheat paste - a mixture of Bluebird flour (favored by Navajo grandmas), sugar and water - he attaches them, pane by pane, to places like the Cow Springs Trading Post. His photo murals echo life on the land, almost as fleeting in the wind and weather as the moments captured in the photos themselves. Although not a Native American, Jetsonorama is the only permanent physician at an Indian Health Service's clinic. 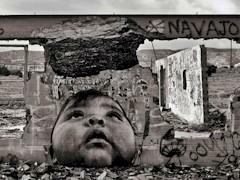 In his blog and elsewhere Jetsonorama said, “I’m trying to present especially positive images of the Navajo on the reservation - to inject an element of beauty, an element of surprise and an element, hopefully, of pride." From the first moment I saw Jetsonorama’s Cow Springs work, it inspired me. His photo murals can be vibrant on one visit and completely gone on the next. In July 2013, when I last visited Cow Springs, not a trace of Jetsonorama’s original work had survived. 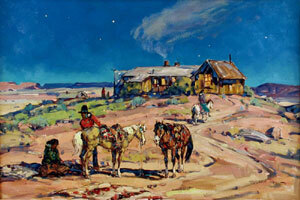 Although I have no problem visiting the ruins of Cow Springs Trading Post during the day, I would not stop at night. Apparently, a few latter-day graffiti artists still frequent the place, along with the ad hoc wrecking crews. Recent poetic evidence tells me that Cow Springs is now a hangout for the “down and out” or disaffected. Once, Cow Springs supported vibrant trade. Later, it supported highway art. With one wall after another now falling to ruin, soon the site shall support nothing more than spirits and pre-ancestral memories. In their homes, the Navajo and Hopi often burn coal for heat, which leads to a prevalence of respiratory illness. With coal at an average price of $90/ton, it would take $875 worth of wood to obtain the same amount of heat. With electrical transmission lines absent over much of the reservation, electrical heating is not an option. Even if available, electricity would cost far more than coal, wood or sparsely available propane. 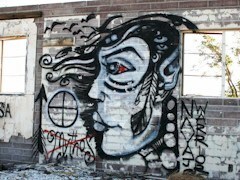 The artist Jetsonorama lives in Inscription House, in northeastern Arizona. There he is the only permanent physician at the Indian Health Service's Inscription House Health Center. 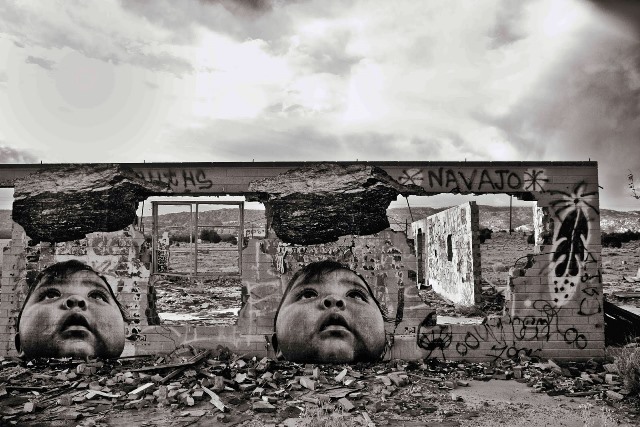 Although not a Native American, his wheat-paste photo murals periodically appear on crumbling or abandoned walls throughout the Navajo Reservation. 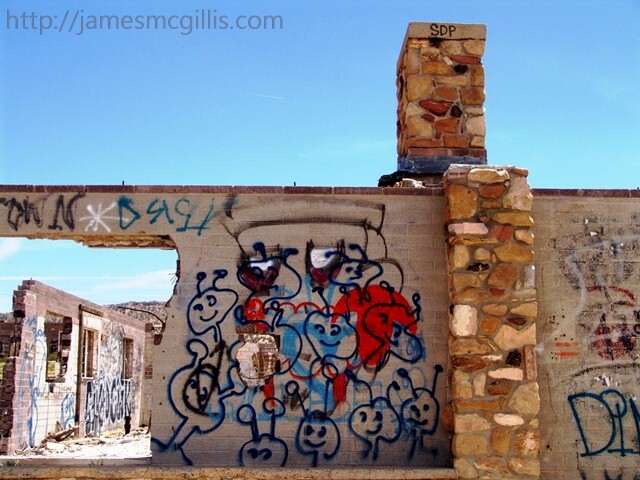 Several years ago, at the ruin of the Cow Springs Trading Post, multiple copies of the artist’s work appeared. A memorable series of Jetsonorama’s posters featured a beautiful Navajo baby. Shown with a large lump of coal looming over its head, the Navajo baby represents Jetsonorama's message that energy from coal contributes to climate change. At the time, he called it, "a metaphorical black cloud over the head of future generations, if we keep burning fossil fuels." As part of the agreement between Peabody Energy and the Navajo Nation, the Black Mesa Complex is obligated to provide free coal to any local Native American family. 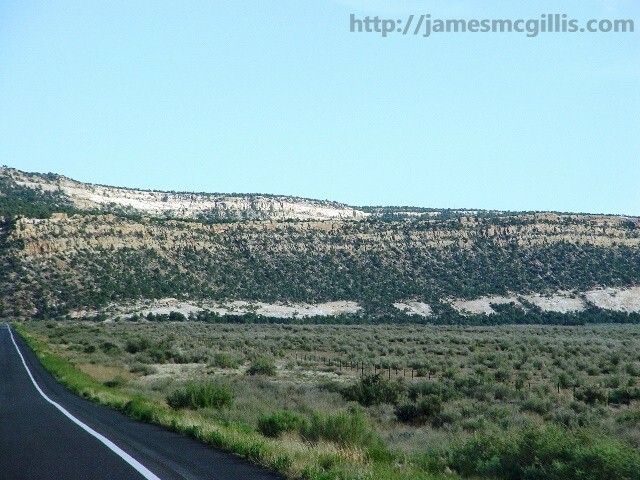 In the fall and winter, when residents seek coal for their stoves, trucks and trailers often clog the road up to Black Mesa. Fully twenty-five percent of residential coal stoves on the Navajo Reservation began life burning something other than coal. Free coal or not, unacceptable levels of smoke and ash often enter the living areas of coal-heated homes. 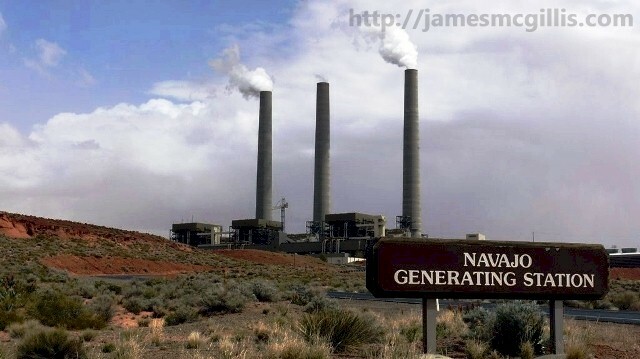 With its three 775 ft. tall flue gas stacks sending coal smoke into the upper atmosphere, local residents may not notice emissions emanating from Navajo Generating Station (NGS). The heat island effect created by NGS keeps a near-permanent updraft operating in the immediate area. Depending on the prevailing winds, however, NGS coal smoke and its nitrous oxide haze may settle near or far, anywhere in Four Corner country. In summer, coal smoke from NGS and other Arizona coal-fired plants affects cities as far away as Durango, Colorado. The burning of coal near ground-level is more detrimental to the health of local residents than the NGS stack emissions. Burning slowly, but continuously over the winter months, each residential coal stove is a constant source of air and water pollution. It takes relatively few inefficient coal stoves to affect an entire community. In winter, when the air is often cold and still, residential coal smoke pools near its source. 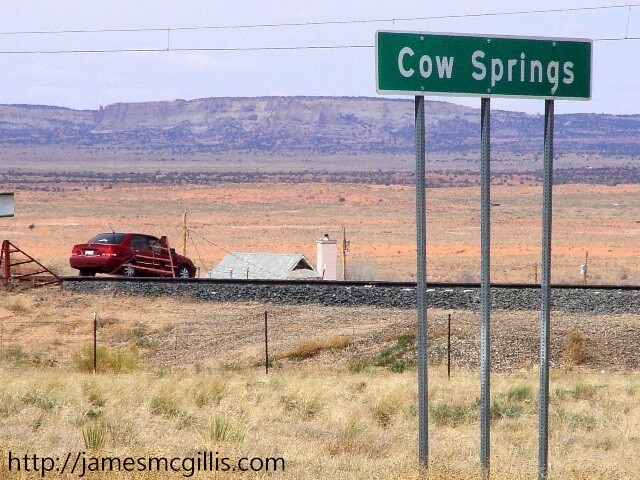 Thus, residents of places like Cow Springs, which sits in a depression midway between Black Mesa and NGS, may experience both residential and NGS coal smoke. 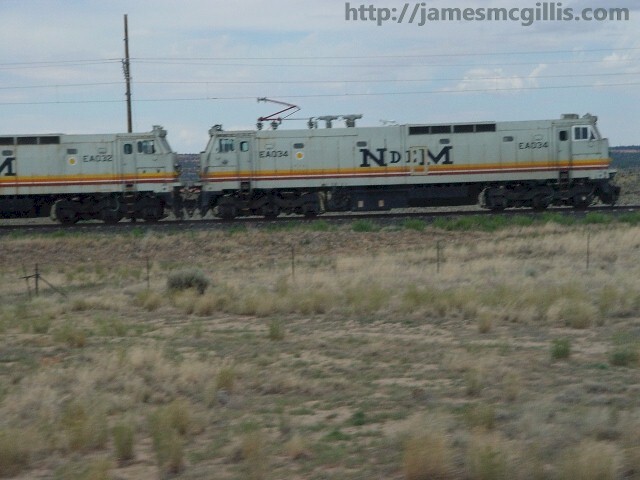 I have a proposal for Peabody Energy and its partners, the Navajo Tribal Energy Authority (NTUA), NGS and the Salt River Project (SRP), which owns the Central Arizona Project (CAP). Instead of removing all outward signs of Peabody Energy’s existence from the Navajo Reservation, the coal mining company and its partners should provide relief to the Navajo who need and deserve it most. At a minimum, the utility consortium should provide pollution controls for any residential coal-burning stove from Kayenta to LeChee. If no such emission-controlled stoves are available, the consortium should provide propane-heating systems to all current coal-burning families. 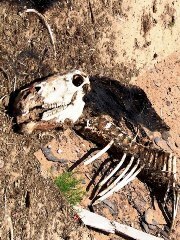 Although they deny it, Peabody Energy has a record of misuse and abuse of the Navajo Nation and its resources. To make up for their excesses, providing subsidized, clean heat and electricity to several thousand Navajo families is the least that they can do. When writing about coal, water and the Southwest, it is easy to become morose and believe nothing in our fossil-fueled political environment will ever change. However, there is some good news. According to a recent Los Angeles Times article, college students from all over the U.S. are raising their consciousness regarding the effects of fossil fuels. In one college or university after another, groups and individuals now step forward to assert their power. Students who have never seen a coal plant or choked on coal smoke realize that their actions can make a difference to all who breathe. Student campaigns such as “Fossil Free UC” have made their mark on policy. Recently, the fundraising foundation for San Francisco State University committed to selling stocks and bonds of companies with significant coal and tar sands holdings. If all three hundred colleges and universities targeted by the “fossil free” advocates join in, the true cost of coal mining and coal burning would become obvious. As our collective investment in Old Energy wanes, that capital can migrate to development and construction of new energy alternatives. 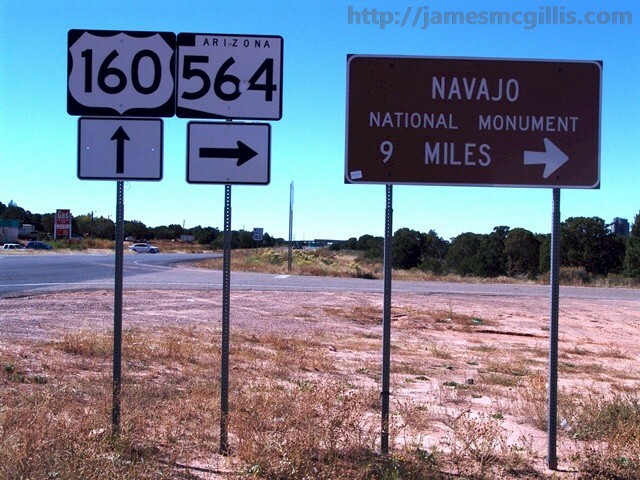 The Navajo and Hopi reservations exist within a desert region. Why not use home-based solar on the reservation to decrease dependency on coal fire? If every Navajo home were to feed power back into the electrical grid, "reverse carbon credits" could allow cleaner propane heating to replace residential coal stoves. 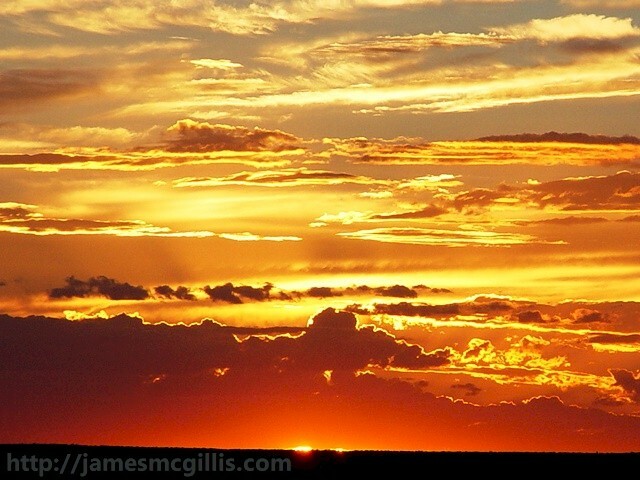 The result would be a construction boom unlike any ever seen in the Four Corners country. No worker ever contracted black lung disease while installing solar panels or a propane heating system. With excess energy flowing back into the grid, NGS could power-down to a lower level. 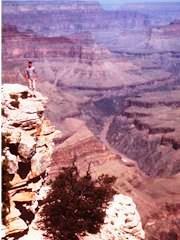 As a result, we could save Navajo and Hopi land, water and air resources for the use of future generations. This is Chapter 4 of a four-part series regarding coal and water in the Southwest. To return to Chapter 1, please click HERE. The Navajo Generating Station (NGS), near Page, Arizona provides the electrical energy necessary to operate the Central Arizona Project (CAP). 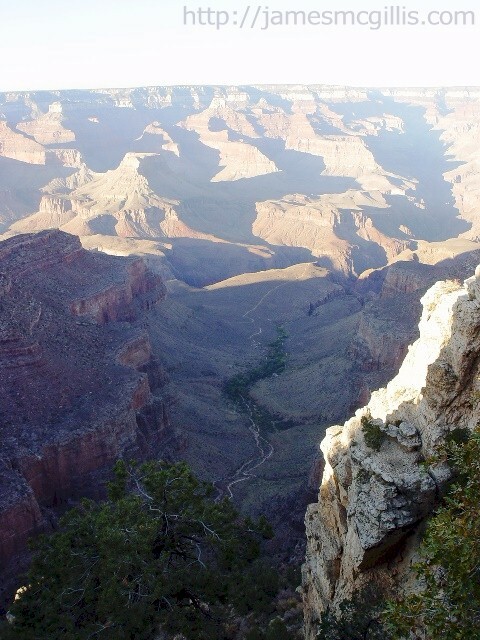 Thus, coal-fired power produced by NGS in the Upper Colorado River Basin enables Arizona’s CAP water delivery system to operate in the Lower Colorado River Basin. As a byproduct of burning eight-million tons of Black Mesa coal each year, NGS currently sells about 500,000 tons of flyash to concrete block manufacturers. Land filled on site is an undocumented volume of scrubber byproducts, including bottom ash and gypsum. The remaining combustion gasses and solids enter into the atmosphere via three 775 ft. tall flue gas stacks. According to EPA spokesperson Rusty Harris-Bishop, the Navajo Generating Station is one of the largest sources of nitrous oxide (N2O) emissions in the country. When processed for medical purposes, nitrous oxide becomes the benign sounding anesthetic, “laughing gas”. When drag racers inject N2O into internal combustion engines, it acts as an oxidant, offering additional power and speed. After departing the flue gas stacks of coal-fired plants like NGS, no one knows the effects of N2O on lifeforms downwind. With an atmospheric lifespan of 120-years, the environmental effects of N2O may last longer than any human lifespan. One wag asked, "Are the clouds of laughing gas emanating from NGS part of a scheme designed to keep nearby Navajo and Hopi tribes pacified?" If the Bashar Assad regime in Syria were to conduct widespread dispersal of nitrous oxide (N2O) gas among the people of Syria, would the U.S. object, calling it a war crime? Such is currently the lot of anyone living in the air shed downwind of NGS or other coal-fired plants within the Four Corners country. If the nitrous oxide emissions dissipate quickly, over a wide area, war crime questions may remain moot. Only with chemical-gas testing on the reservation shall we understand the effects of long-term exposure to N2O and other emitted gasses. Unless changed, this complex set of environmental hazards will operate as usual. New cases of Black Lung Disease will surely continue among current and former Black Mesa miners. 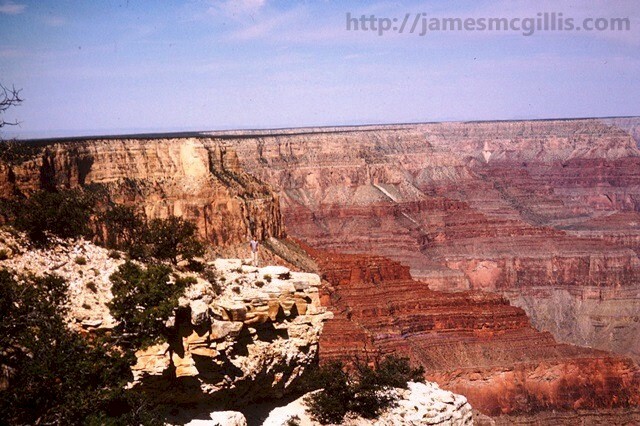 Earlier studies found that NGS alone caused between two and seven percent of airborne winter haze downwind at the Grand Canyon. 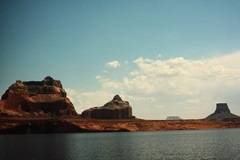 Not only does NGS siphon vast amounts of water from Lake Powell, its heat-island effect increases evaporation of the remaining lake water. Heat and greenhouse gasses emitted from the NGS stacks drive cool air and moisture away from the area. As part of an environmental death spiral, NGS directly robs CAP of what it needs most, which is an adequate water supply downstream. 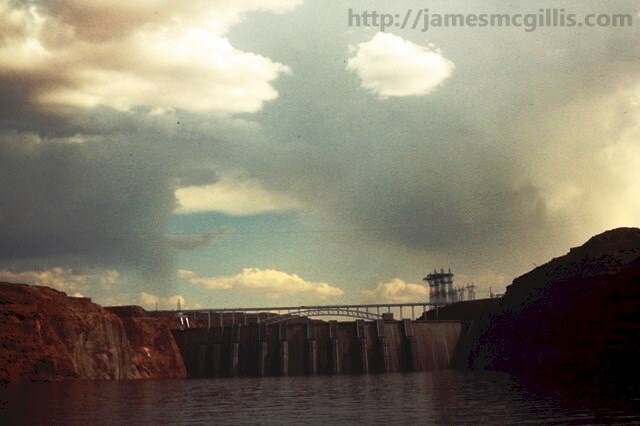 Hydrologists, utilities spokespeople and federal regulators offer only lip service regarding interdependency between the Upper and Lower Colorado River Basins. Collectively, they have yet to admit that diminished input and too many outputs may soon drain the greater Colorado River watershed. Only when officials admit that there is a collective shortage shall they find better uses for our resources, including earth, water and fire. In 2009, I drove past the Peabody Coal Company Access Road on U.S. Highway 160. 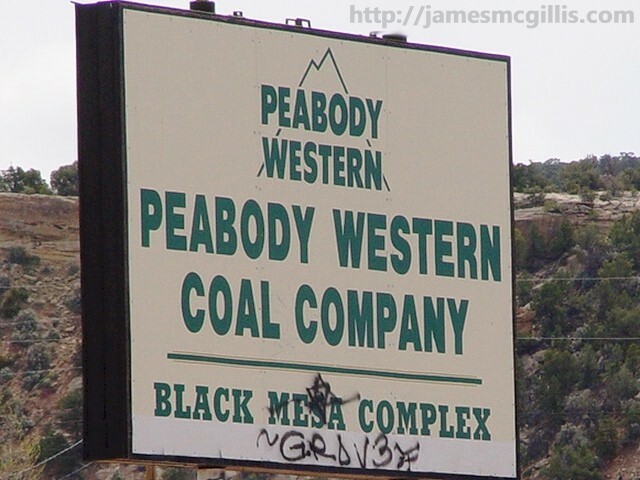 There, a backlit sign featured the words, “Peabody Western Coal Company” and “Black Mesa Complex”. 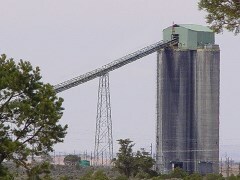 In recent years, plant owners at nearby Navajo Generation Station (NGS) and the Navajo Nation gave Peabody Energy a twenty-five year lease extension. 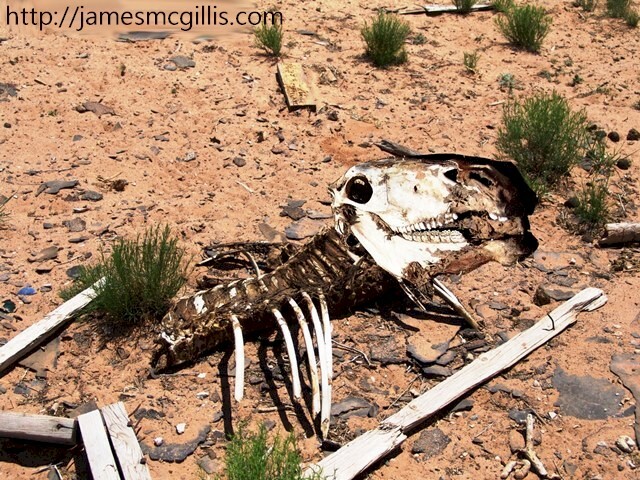 That agreement yoked the Navajo and Hopi Nations to an environmentally destructive course. 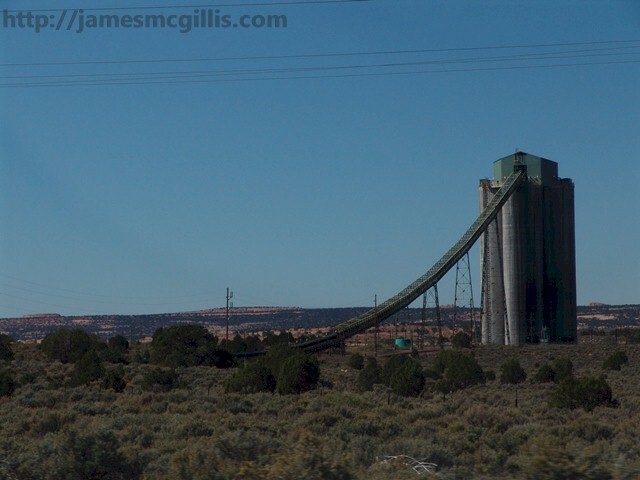 When some Navajo and Hopi threatened to shut down the Black Mesa Complex, Peabody Energy "doubled down", raising their annual royalty fee for Black Mesa coal from $34.4 Million to $42 million. Over Hopi Nation objections, the twenty-two percent increase in royalties was enough to secure Navajo Nation agreement. No one knows how much profit Peabody Energy will reap from their continued strip mining of Black Mesa, but it will be orders of magnitude larger than any royalty fees paid. Succumbing to what some call a meager financial incentive, the Navajo Nation traded the health of its people for the benefits of Old Energy. In their marketing campaign, Peabody and the Navajo Nation raised the prospect of continued employment for the Navajo and Hopi workers. Skeptics say that strip-mine-jobs cause more health and environmental harm than any economic benefit that they may provide. As the saying goes, “Those who ignore history are destined to repeat it”. In post-1984 America, companies that hide their history shall gain little benefit from their deceit. Since 2009, Peabody Energy has removed all references to “Peabody Western Coal Company” and “Black Mesa Complex” from their corporate communications. In line with their expunging of the historical record, Peabody Energy also removed all “Black Mesa Complex” informational signage from U.S. Highway 160. Under their current marketing scheme, Peabody Energy applies the innocuous moniker, “Kayenta Mine” to the largest strip mine in the West. Out of sight and out of mind is where Peabody Energy wants their dirty little secret to lie. 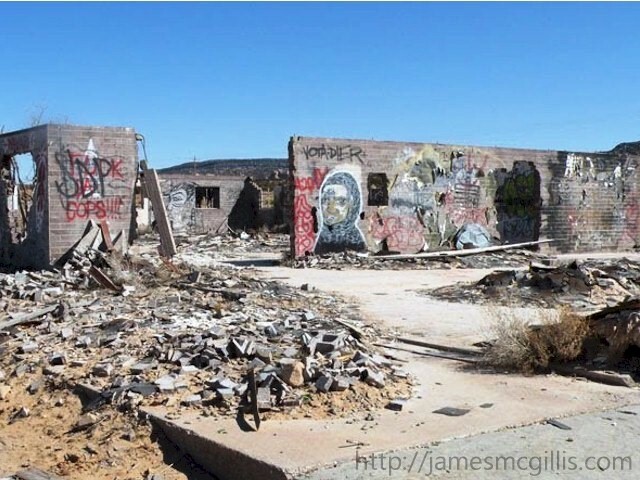 Luckily, for the company, destruction caused by their operation lies unseen behind the ridge of Black Mesa. Only with satellite photography can we see the extent environmental destruction occurring at Black Mesa. Despite Peabody Energy’s efforts to hide their mining operations, gray trails of effluvium lead down the canyons from the area. At the lower end of newly deepened gulches, that “gray matter” turns and runs north toward Kayenta. 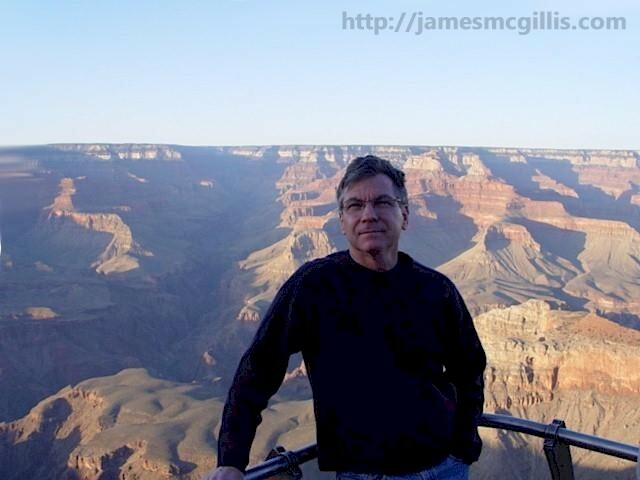 Even if the mines were to close today, the deep scars on Black Mesa would take several geological epochs to heal. 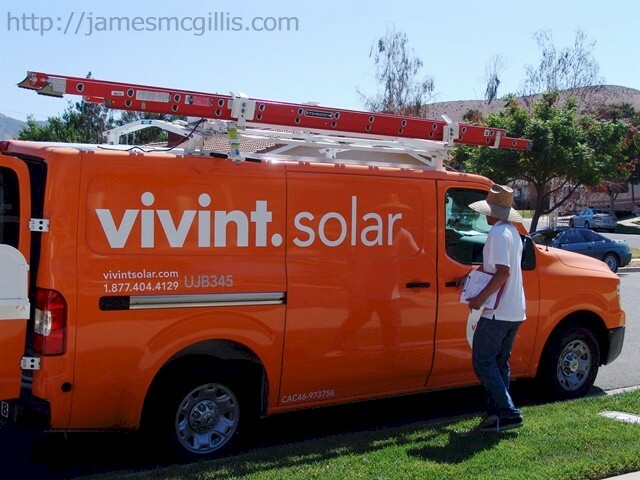 In a community minded effort, NGS and its owner, the Navajo Tribal Utility Authority (NTUA) are now extending electrical power to sixty-two homes in the area surrounding LeChee, Arizona. According to the U.S. Census Bureau, the population at LeChee is ninety-eight percent Native American. Located less than two miles from NGS, many of LeChee's residents work either at the plant or as service workers in nearby Page, Arizona. With a 2010 population of 1,443, LeChee had lost 163 residents over the previous decade. How many of them departed because of chronic respiratory diseases, no one knows. Prior to electrification, how many of the LeChee homes burned coal for heat? This is Chapter 3 of a four-part series regarding coal and water in the Southwest. To read Chapter 4, please click HERE.